Since coming to Istanbul more than a decade ago, we have come to associate a loaf of the city’s iconic crusty white bread with satisfying lunches in an esnaf lokantası, using chunks of the humble loaf to sop up whatever was left on our plate. 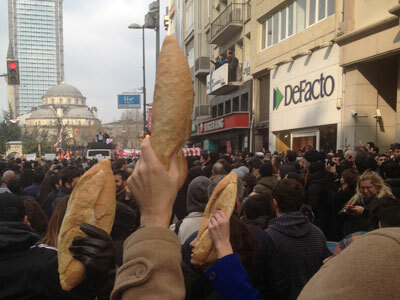 Since Tuesday, though, a loaf of bread has become something else in Istanbul: a symbol of both mourning and protest. Berkin Elvan was a 14-year-old living in Istanbul’s working-class Okmeydanı neighborhood. On June 16 – at the height of the Gezi Park protests that rocked Istanbul last summer – Berkin went out to buy a loaf of bread. He never came home. His parents later found him in a hospital, in a coma due to a grievous head injury that his doctors attributed to his being struck at close range by a police tear gas canister (as Human Rights Watch has documented, several other protesters were similarly injured last summer). After spending 269 days in a coma, Berkin died Tuesday, sparking protests across Turkey, where a loaf of bread became a stand-in for the now-departed child. After his burial today, an event that drew tens of thousands, the police forcibly broke up the procession and Istanbul’s streets were again filled with the acrid smell of tear gas. It’s been almost a year since the Gezi Park protests, but sadly, what animated those events – a general concern for the soul of Istanbul and the direction in which those in charge are taking not just the city but all of Turkey – has yet to be addressed. We send out our condolences to Berkin’s family. May his soul rest in peace – and may Istanbul’s bread loaves find their way out of the front lines of protest and back to where they belong.